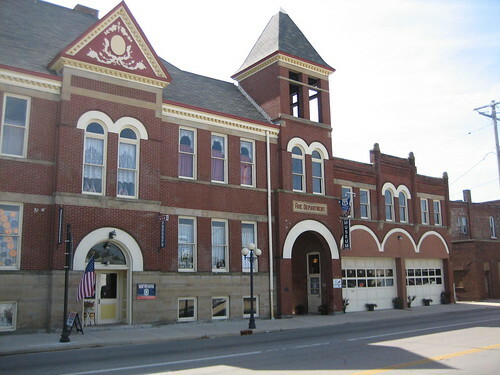 The Pontiac City Hall and Fire Station building is a 1900 Romanesque Revival (wiki-brief) structure in downtown Pontiac. Actually it is two separate buildings connected by a common bell tower at the center. It was designed by John H. Barnes and built by J.A. Sipe. The back of the building is graced with the large mural seen below. And, yes, before you ask, that is one of the same cars I saw that day in Dwight, it’s like they were following me, or vice versa. The bell towers are identical which helps bring a sense of whole to what would otherwise, very obviously be, two separate buildings. In fact, the fire department building and the city hall are both different heights, and oriented differently. 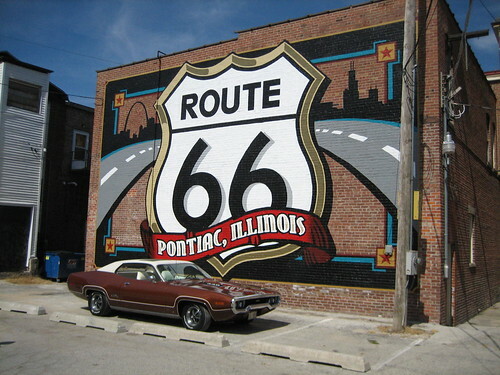 The next site is the cannot miss site on your Dwight to Chenoa Route 66 tour. The Livingston County Courthouse, in the heart of the downtown district of Pontiac is a truly a jewel. As a gawked at it on first sight, I could only manage a stumbling, “they don’t make ’em like that anymore”. This elaborate, Second Empire (wiki – brief overview only) structure is monumental and overwhelming. It stand 55 feet from the basement to the eaves, and the corner towers adds another 70 feet to the height. 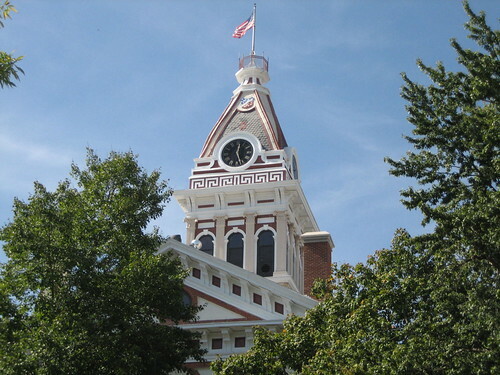 The third building on to carry the name Livingston County Courthouse, it was built in 1874 and the clock added in 1892. 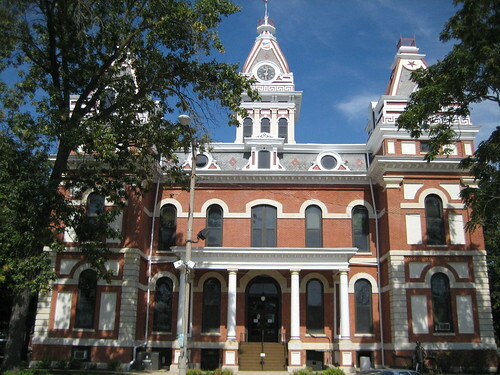 The courthouse was designed by John C. Cochrane of Chicago. His plans were selected over other applicants even though they were more expensive, the county board found his design more sturdy, fireproof and elegant among other qualities. 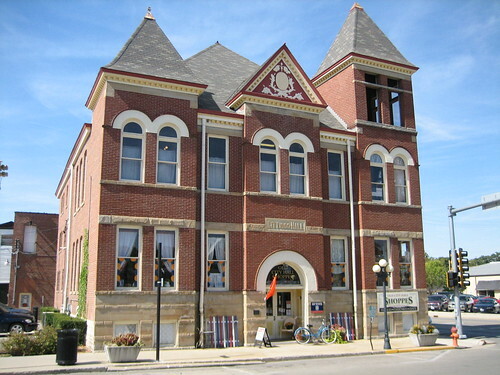 The building still serves as the primary judiciary center for Livingston County, Illinois. Tomorrow we leave Pontiac and journey down the historic roadbed to a former state police station. I regard that as the most beautiful courthouse all along Route 66. The ones in Lincoln and Carlinville, Illinois, and Carthage, Mo., are also impressive. It shocked and amazed me, that’s for sure. When I go on road trips I usually have a good list of sites and I try not to access the archive photographs available from the IHPA so I can be surprised when I arrive. Sometimes, though, if I didn’t look at the photos I wouldn’t find the place, but most sites are easy to find. I will add those places to my ever expanding list of things to see in the United States before I die. Thank you. So nice to see your pics of your visit to our town. I manage the shoppes in the Old City Hall building, and never tire of walking to work by our old courthouse. Your photos are beautiful. 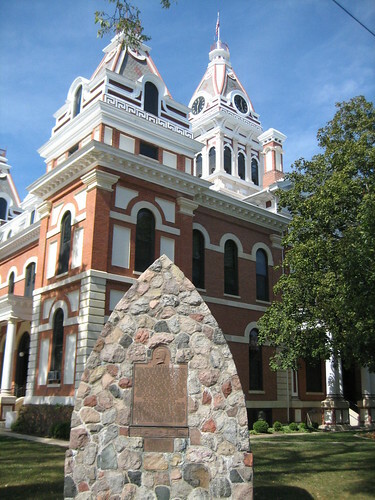 My great grandfather built the stone arrow head in the courthouse square. I still have the stone cutting tools.